I had a chance to cook for my mother-in-law and when your husband speaks highly of his parent’s cooking it would be hard for a new member of the family to get that seal of yummy approval. 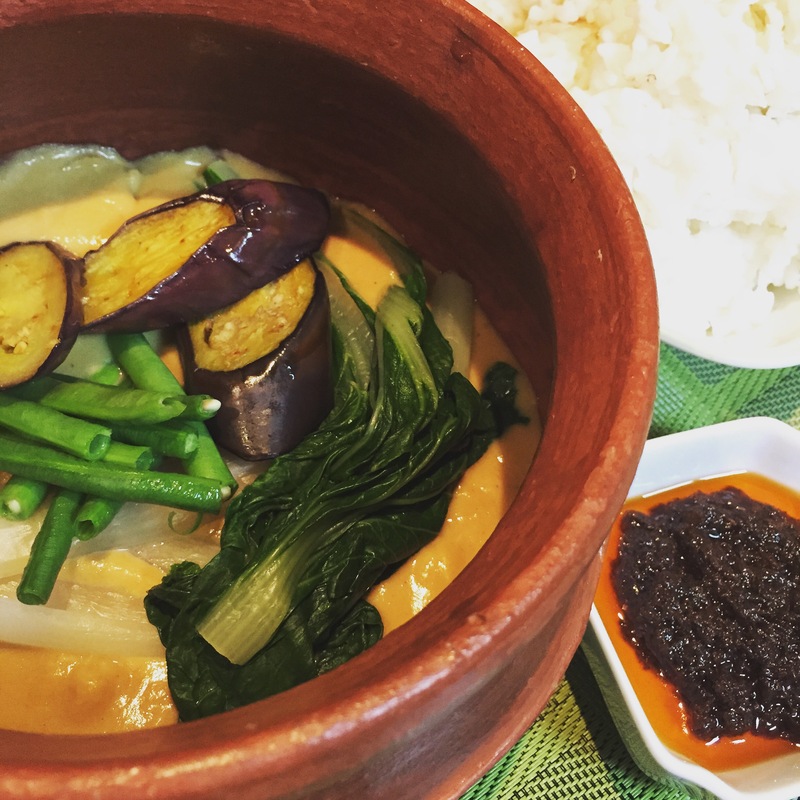 There I was a new wife standing in our kitchen with a couple of printed recipe on how to prepare my MIL’s ultimate favorite food which is kare-kare. It doesn’t help that this is my first time to prepare the dish by myself. I read through each recipe and took note of the procedure and ingredients that was familiar to me. C’s parents enjoyed the lunch we prepared for them with much gusto and though I haven’t got a chance to prepare a meal for them again I honestly think that this kare-kare got their seal of yummy approval. Kare-kare is a peanut butter base oxtail and tripe stew with a variety of mix vegetables, serve with rice, and bagoong alamang on the side. Place ox tail and tripe to a large casserole cover with water. Bring to a boil and remove scum as it rises. Cover and simmer until tender, about 4-6 hours. Alternately you can use a pressure cooker to cut the cooking time. Strain about 5-6 cups of meat broth and set aside. Cut meat to serving pieces and set aside. Prepare the vegetables. Cut the cabbage into two and remove the core. Cut of the white part of the Petchay from the leaves. Cut string beans to 2″ long. Discard the hard part of the puso ng saging and cut to cubes. Place rice flour on a skillet and toast it till lightly brown. Set aside. Mix peanut butter with 1 cup of broth. Mix toasted rice flour with 1 cup of broth. In a large casserole, heat the annato oil and saute the onion and garlic for about 15 seconds. Add meat pieces and cook until it has absorb the color of the oil. Pour in 3 cups of broth and bring to boil. Lower heat and add vegetables wait a minutes after each vegetable: sitaw, eggplant, puso ng saging, cabbage and pechay. As soon as you’ve added the pechay pour in peanut butter and rice flour mixture. Stir to blend well and make sure that you don’t have lumps. Cook for another 2 minutes until sauce is thick. If you find that your sauce is too thick for you just add about 1/2 cup of broth till you get the right consistency. Serve hot with rice and bagoong alamang on the side. Let me know once you tried it and if you have any questions just send me a mail. hubby cooked this one time and never nang inulit. hirap daw! sayang, ang sarap pa naman 🙂 haha! hey abigail! missing you… just saw the good news here ! congratulations 🙂 my best wishes to your lil family!